As you may have discovered, Windows 7 itself doesn't come with an email program pre-installed; but in many cases, your computer manufacturer will conveniently add Windows Live Mail to your PC (a free email client also created by Microsoft). If Windows Live Mail is installed, it is automatically set as the default email client; in this tutorial, you will learn how to change your default email program for Windows 7 otherwise. If you do no not have any email application currently installed on your computer, have a look at our list of free email programs for Windows 7. Follow these steps to configure which email program launches with email links: there are two ways you can configure the default mail handler - we will explain both the easy way and the advanced way; advanced instructions are in blue-ish, and you can disregard them if you want. Click on the start menu, and type "default program" in the search field; you can either click on the "Default programs" to see all options for customizing default applications for your computer (advanced users), or click on the "Set your default programs" link (easy way, for beginners) - this one will straight away bring up the screen you want. If you clicked on "Default Programs", you can now click on the "Associate a file type or protocol with a program" link to tie .msg file types or mailto: protocol the email client of your choice. Then, choose the application you want to use as default email program from the listing on the left, and click on it: Windows 7 will load some information about the selected program, and display it on the right hand side. The listing is alphabetized, and here are common email applications as they are called (which affects their position in the list) - "Microsoft Office Outlook", "Opera Web Browser" (to use M2 as default email program), "Thunderbird" (no Mozilla in front), "Windows Live Mail", etc. If you click on the "Choose defaults for this program" button, you will access the advanced default program settings - the same you accessed if you clicked on the first result link in the start menu. 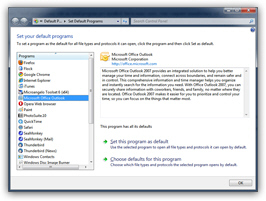 Once you have chosen the email program and applied it as the default email program, click on the OK button to save the new setting and return to Windows.